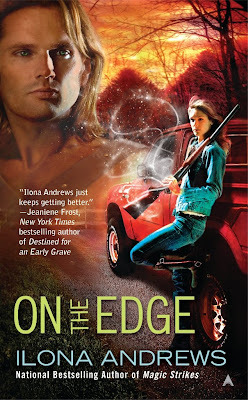 Ilona Andrews posted the cover for On the Edge today, the first book in a new urban fantasy series being released September 29,2009. You can read an excerpt of Chapter 1 on her website. Rose thought if she practiced her magic, she could build a better life for herself. But things didn’t turn out how she planned, and now she works a minimum wage, off the books job in the Broken just to survive. 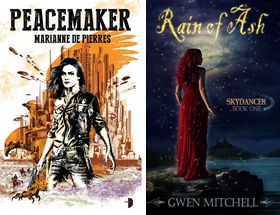 Then Declan Camarine, a blueblood noble straight out of the deepest part of the Weird, comes into her life, determined to have her (and her power). But when a terrible danger invades the Edge from the Weird, a flood of creatures hungry for magic, Declan and Rose must work together to destroy them—or they’ll devour the Edge and everyone in it . . . Cool cover. Interesting premise. Ilona Andrews really does seem to enjoy doing dual worlds. Tez long haired men always remind me of LKH characters. Hey Carolyn this should be a great new series. You can always count on Ilona for excitement.